Xio Wants Stars is a cute, physics-based, strategy game about Xio, the latest planet in our galaxy. Did you know, Xio was born without any stars in his sky?! He is now seen zipping around other planets, borrowing a few from them. Help Xio add a little glitter to his sky. Use ‘left’ and ‘right’ arrow keys to make Xio swing. Use space bar to release Xio from one planet’s air and swing in to another across 30 challenging levels! 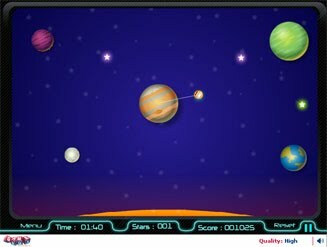 Win a ‘Star Planet’ Medal for making a score of 1500!